U.S. President George Washington traveled to Newport, Rhode Island where he met with the congregation at the Touro Synagogue. While there, the leader of the congregation, Moses Seixas, handed Washington a letter that noted past persecution and expressed hope that liberty of conscience would prevail in the new nation. 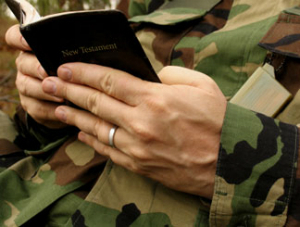 The U.S. House Armed Services Committee has adopted Congressman Todd Akin's (R-Missouri) amendment to the National Defense Authorization Act (NDAA) which creates a statutory conscience protection clause for members of the military in general and military chaplains in particular. Ben Carson: "Many people came to this nation and they were trying to escape from societies that tried to tell them what they could say and what they could think and here we come reintroducing it through the back door. And we need to remember that it is not important that we all think the same thing and the emphasis should not be on us all saying the same thing. The emphasis should be on learning how to be respectful of individuals who have a different opinion." Within the larger context of American Protestant Christianity the debate continues without resolution. Among Christians, creationists are often asked to consider various forms of evidence of a long-history of the earth, but those advocating for a long-earth have largely ignored discussion of the genealogies of the New Testament and the concepts of original sin and salvation. Christian evolutionists have failed to provide a verse-by-verse rebuttal to the Biblical Creation narrative or to acknowledge the extent to which acceptance of creation would impact theology. Instead theistic evolutionists operate on the supposition that Creationists will eventually bifurcate their religious beliefs from scientific understanding, because incompatibilities must be resolved in favor of science. This places faith directly in conflict with science and any resultant battle on these issues will take centuries if true academic freedom is to be granted, but can resolve faster if the voices of religious dissent are silenced and those who have openly criticized evolution are denied a seat at the academic table.